Events are generated automatically within by Vantage to create a record of notable activities throughout the system. These may be Vantage errors, client traffic deviations, or many others. Alerts may be generated when a trigger such as a system event occurs. If all conditions within the Alert Config are met, an alert is created. It may be used to actively or passively notify administrators, and may be deleted after being viewed or after an elapsed period of time. The Operations > Alerts > All Alerts page shows all Alerts across Avi Vantage. The functionality on this page is identical to that of the alerts tab found in the virtual services and pools pages; however, those pages are filtered to only show alerts related to those objects. 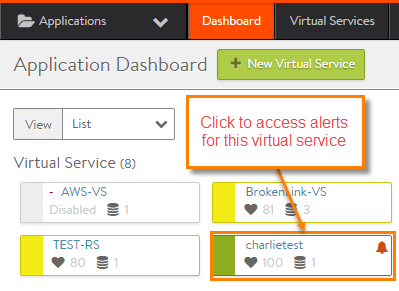 See the Virtual Service Alerts tab for more information on navigating the Alert options. Click Alerts to display the alerts log for the virtual service, or click the alerts icon next to the health score to display a popup list of the mot recent alerts. Alerts filter events to highlight important information. Avi Vantage includes a number of default alerts via the Alert Config page. The default alerts may not be deleted, but can be modified or disable as needed. Alert Configs determine whether or not an alert should be generated. Search: Search against the alert names in the table. Create: Opens the New Alert Config popup. Edit: Opens the Edit Alert Config popup. Delete: Remove the selected Alert configuration. Name: Name of the Alert. Alert Level: Level, or severity, of the Alert (Low, Medium, or High). Alert Action: Specifies the alert action that is triggered when the Alert is generated. Type: Whether the Alert is Real Time (5-second window) or Rolling Window (5-minute window). Enabled: Whether the Alert is enabled or disabled. The New and Edit Alert Config popups share the same interface. Name: Enter a unique name for the Alert Config. External: This alert will trigger an alert action, but will not create a local alert on Vantage. High: Indicates a critical problem. Medium: Indicates a less-severe problem. Low: Indicates a minor problem. Event: If the selected event occurs, generate an alert. Type: Create an alert every time an event occurs, or only create an alert if an event occurs a specified number of times within a time window. Rolling Window Disabled: When the event occurs, an alert is generated. Rolling Window Enabled: An alert is generated if the Number of events is met or exceeded within the desired Time Window. Time Window: Select a custom time frame. The default is 5 minutes. Alert Expiry Time: Alerts are intended to notify administrators of pressing issues that warrant attention, and many alerts are only actionable while the problem persists. Alerts are therefore automatically deleted after a period of time, with the underlying events and logs serving as the definitive long-term records. An alert may be manually dismissed using the Alerts tab for the selected item (such as a virtual service). Number of Occurrences: During the Rolling Window timeframe, the event must occur this many times to trigger the alert. Throttle Alert: Sets the duration of time within which an alert may only be created once. Description: Enter a custom description for the alert. Alert Config Status: Disable an Alert Config from generating new alerts. Alert Action: Points to the alert action group for the alert. The action object is configured to perform an action such as email, Syslog, etc. Source: Set the event or metric that will trigger the alert. Event Occurs: If an event happens, such as login failure. This field is required when alerting on events. Event Does Not Occur: If the event does not occur, trigger the event. This field is optional. When used, both this field and the Event Occurs must be true for the alert to trigger. This option is useful if expecting to see an event within a period of time defined via the Alert Threshold Duration. For instance, an Event Occurs is set to server down while Event Does Not Occur is set to server up. If the server bounces down and back up again within a 5 minute window, don’t create an alert. Object: Inspect the metrics of an object such as virtual service, Service Engine, or pool. Instance: Select the specific object of the type specified in the Object field. Metric Occurs: Select a metric which is used as the trigger for the alert. Comparator: The value returned by the Metric Occurs must match the greater than, less than, or equal to the Value field. Value: The numeric value the metric is compared against. Some metrics will be percentage from 0 to 100, while throughput is in bits per second, such as 1000000. Duration: The length of time during which the metric must be true. Generally this means an average of the metric over this period of time. Keep in mind some metrics are not collected at an aggressive rate. For instance, vCenter updates server CPU information every five minutes. Therefore duration should be longer than 600 (seconds). When an alert is generated within Vantage, it is immediately able to be viewed by an administrator. This means the administrator must sign into Vantage, navigate to the appropriate object and view the alerts to know if there is a serious issue. Alternatively, alert actions may be set up, which allow alerts to be proactively sent from Vantage to an external destination. Search: Search for the name of the alert action. Create: Opens the Create/Edit Alert Action popup. Edit: Opens the Create/Edit Alert Action popup. Delete: Remove the selected alert action. This example shows the system default alert actions (System-Alert-) and some custom alert actions configured by a Vantage user. The default system alert actions may be modified, but not deleted. Name: The name of the alert action. Syslog: Shows whether the alert action is configured to send Syslog messages. Email: Shows whether the alert action is configured to send Email messages. 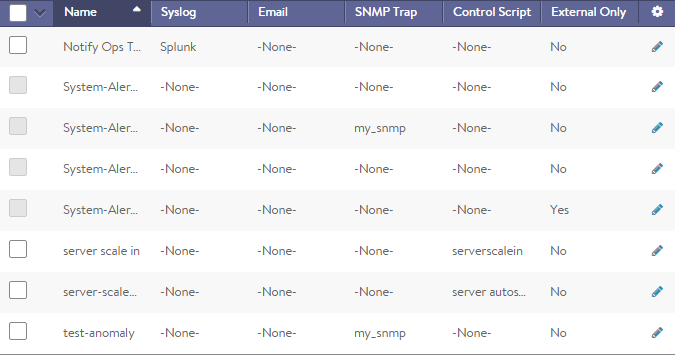 SNMP Trap: Shows whether the alert action is configured to send SNMP traps. Control Script: Shows whether the alert action is configured to trigger execution of a ControlScript. External Only: Shows whether the alert action is configured to execute an external script. Alert actions may be stored locally on Vantage, and they may also be sent to remote systems. To direct alerts to a remote system, first configure a Notification or a ControlScript which may be referenced by the alert action. Name: User friendly name for the action alert. Only Generate External Alert: By default, Vantage generates a local alert visible to admins of Vantage, in addition to any external alert systems configured. When this option is enabled, alerts mapped to this alert action will not generate a local alert within Vantage. Alerts may still be sent externally via any of the methods below. AutoScale Trigger: Use the alert to trigger AutoScaling. Email: Select an existing Email Notification. Syslog: Select an existing Syslog Notification. 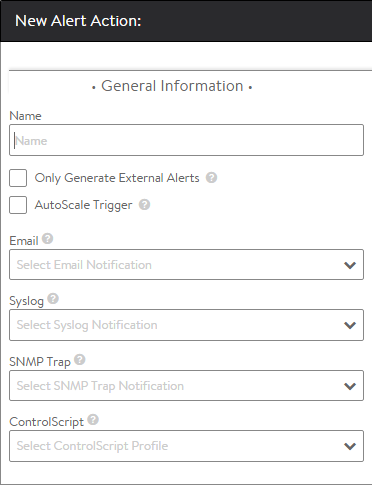 SNMP Trap: Select an existing SNMP Trap Notification. ControlScript: Launch a custom script. ControlScripts are Python-based scripts executed on the Avi Controller. These scripts may make configuration changes to Vantage, or send data externally to a remote system. For instance, a ControlScript could instruct an orchestrator to spin up new servers if all the servers are down within a pool or notify a security team if a virtual service is under a severe denial of service attack.